To better serve our customer base, a variety of service plans have been created to allow the customer to choose the level of support desired for a particular machine. All machines shipped prior to April 15th, 2007 will carry the standard Warranty for 1 year and will receive a second year extended Warranty as per the new policy. All machines shipped prior to April 15th, 2005 are subject to the new policy starting April 15th, 2007. For those customers with existing service contracts, the existing contracts will be converted to one of the new service plans as soon as the contract expires. *This document will serve as Versatec, LLC policy for all machines, extended warranties and service contracts purchased from Contact Systems, Inc. Extended warranties and service contracts purchased from Contact Systems, Inc, will continue without interruption. This Warranty can be augmented with one of two supplemental plans (Red and White). At the end of this Warranty period the customer can elect to extend the Warranty (and supplemental plan). The Extended Warranty is for parts and labor only and can be extended for up to three years from the initial machine ship date. At the end of three years the customer must opt for one of the three non-Warranty plans (gold, silver or bronze). If during the first three years the Warranty should expire without renewal the machine cannot return to warranted status but coverage may be obtained through one of the other non-warranted plans. It is highly recommended that the machine remain warranted for the first three years because the non warranted plans cost the same as the warranted plans but do not provide coverage of non-wearable items (compare Red Plan to Gold Plan and White Plan to Silver Plan). 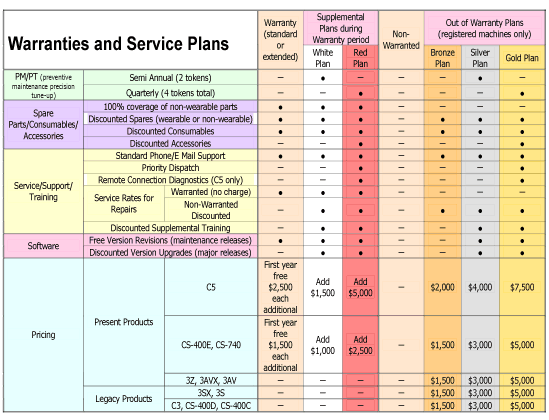 For details see the “Warranty and Service Plans” table in section two of this document. Non-warranted machines must be registered and under contract in order to receive technical support. There are three plans to accommodate various support level requirements for non-warranted machines. All plans including the most basic plan (Bronze Plan) provide the customer discounted service rates, discounted spare parts and the standard phone/email support. All new machines bought from Versatec, LLC are registered to the original owner. The machine will remain registered to the original owner as long as the machine remains in the possession of the original owner regardless of Warranty and service contract status. When a machine changes possession it is neither automatically registered to the new owner nor are the Warranties and/or service contracts automatically transferred. If you purchased your machine from anyone other than the manufacturer, the machine by default is no longer registered. Any service contracts the machine may have been under are non-transferable. To reinstate the registration, contact our Technical Services department and ask for the machine registration form. When this form is filled out and returned you will have immediate access to our technical support team. Please see the section titled “Acquiring Service for Non-Contracted Machines” on page 4 for details. If you purchased your machine new from Versatec, LLC and had maintained your machine utilizing Versatec, LLC trained personnel, or if the machine was purchased from someone other than Versatec, LLC but the machine was under a Versatec, LLC service contract at the time of the change of possession, then it is possible that the machine can be contracted to the new owner without a machine evaluation visit by one of our Field Service Engineers (FSE). However, if the machine was not under a Versatec, LLC service contract or if it has been 6 months or more since a Versatec FSE has last serviced the machine, the machine may need to undergo a machine evaluation in order to qualify for a service contract. During this a visit a thorough evaluation of the machine will be done by a Versatec FSE. The customer is responsible for the cost of the evaluation visit plus incurred costs (travel expenses and per diems). Based on the FSE’s report the machine will either be qualified or not qualified. If the machine is not qualified the FSE will provide a report of the items that must be rectified in order to become qualified. If the customer wishes the FSE can make arrangements to extend his stay and rectify the machine issues. Should the customer qualify for and obtain a service contract within 30 days of the evaluation visit, a credit of the difference between the standard and discount rates will awarded to the customers account. For details about service rates see the Service Rates for On-Site Service table. What if I have already purchased Second Owner Support? If you have purchased Second Owner Support for a particular machine it is automatically registered with us, you will receive Bronze Plan benefits for a two year period from the time the Second Owner Support plan was purchased. Versatec, LLC highly recommends the registration of non-registered machines and subsequent service contracts. Generally speaking, the service contracts pay for themselves through the discounted service rates, discounted spare parts and included standard phone/email support. Further savings can be realized with more complete coverage plans through additional discounts on consumables, accessories and software upgrades. However, for those who still would rather not enter into a service contract we offer a “pay as you go” arrangement for phone support and service calls. Any customer can call our Technical Services department during normal business hours and receive technical support with an approved credit card. In the case of multiple machines, the first machine is at the price listed in the “Warranties and Service Plans” table. Subsequent machines (same models) are discounted 50%. With the Bronze plan a price cap applies whereby the total cost for the contract is a maximum of 2X the full list price of the first machine. Example 1 A customer has (2) C5 machines and wants the extended warranty and supplemental White Plan for each machine. The cost for the first machine is $5,000 and the cost for the second machine is $2,500 for a total of $7,500. Example 2 A customer has (5) CS-400 series machines and would like the Bronze Plan for each. The cost for the first machine is $1,500 and the cost for the subsequent machines is $750 each. In this case the plan cost would be capped at $3,000 as opposed to $4,500 ($1,500 for first machine and $3,000 for 4 subsequent machines—Bronze Plan only). 1. All multiple machine plans are priced assuming synchronization of PM/PT schedules for the machines on a multiple machine plan. 2. Multiple machine plans are plans for up to 5 machines. For a service plan for more than 5 machines consult the factory.